Free 8×12 Shed Plan Available for Download Now! You are here: Home / Blog / Free 8×12 Shed Plan Available for Download Now! With our new deck complete and spring just around the corner, I’m starting to look for shed plans to build a new shed. Our old deck was small, but it housed a nice convenient shed underneath. The person who built it used the same vinyl siding as the house and it blended in very well. Since it was under the deck, access to the shed was covered and the door was in a convient location. So it was also very handy. When we built the larger deck we decided to use the space under the deck for more living space. We put down a stamped concrete pad and we are looking at installing a hot tub or maybe getting a ping pong table for fun. But we still have all of the stuff that was in the shed. It’s in the garage, under thed and stored in the basemant. 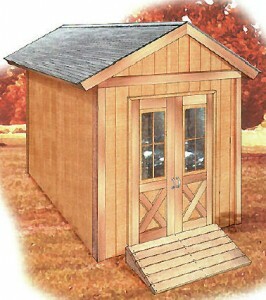 I want to build a classic looking shed and put it near the back fence. It won’t be as convenient but it will be in a spot we don’t use very often so we are not loosing any backyard space. I also want it to look good because I’m going to use it as a screen to add some privacy in our backyard. Lately, I’ve been doing lots of searching on the Internet and I found a free 8×12 shed plan. My last shed was 10×10 and it was a great size for all of my outdoor and garden stuff. the nice thing about the 8×12 plan is it is a bit longer and it will fit in perfectly where I want to put it. The plan comes as a PDF, so as long as you have a free PDF viewer you can download and print it. If you are ready to download the free plan, please click – Download Free Shed Plan Now!